There are so many coin grading, certification, and slabbing services available today that it’s sometimes hard to tell them apart or even know which third-party coin graders offer the best services or benefits. While there are more than a dozen different companies (all colloquially known by the acronyms of their business names) offering coin grading services, there are only a select few that have really risen to prominence in the coin industry. What Are Third-Party Coin Grading Firms & What Do They Do? The different coin grading services and some of the potential distinctions of each coin certification firm will be addressed later in this post. First, it is important to explain what a coin grading service does, and what it is not. The main objective of any reputable coin slabbing firm is to identify and authenticate coins. The best coin certification companies hire some of the most skilled numismatic professionals in the nation, who use their inherent knowledge, hobby resources, and diagnostic tools to determine the authenticity of each coin. If the coin is undamaged, these coin certification firms will also assign a grade to the coin. The last step in the process of certifying a coin is to encapsulate it within a tamper-evident, sonically sealed plastic holder in which a tag bearing the coin’s type, grade, and other identifying information is also included. These tags will also include the coin grading firm’s logo and possibly a barcode or other unique identifying marker. Once the certification service has completed the process of attributing, grading, and encapsulating a coin, the piece is returned to its owner. From beginning to end, submitting a coin for certification and waiting for the piece to return can take anywhere from two to six weeks, based on the volume of work the certification service is handling. Some graders charge an expedition fee to speed up the coin slabbing process. In some cases, coin certification companies will attend an event, such as a major coin show, and provide authentication and slabbing services on the spot. What isn’t a coin grading company? For one, it isn’t an appraisal service. It’s not the place where you would go to have your grandfather’s hoard of Morgan silver dollars inspected solely for value. Third-party coin grading companies will gladly verify those coins for authenticity and, if undamaged, will encapsulate them. But they will not give you a value on your coins. That, actually, is something we at Coin Values can help you find out. We offer a series of price guides for many of the most commonly traded coins, including wheat cents, silver dollars, and other U.S. coins. What else aren’t third-party coin grading companies? They aren’t auction houses. They will encapsulate your coins to help make them more marketable to an auction house, but they will not buy your coins, and they don’t sell coins either. If you think you have a rare coin that you want to sell to a coin dealer or submit to an auction house, you should send any collectible coins to a reputable third-party coin grading firm for authentication. Many people, especially newbies in the hobby, are hesitant to send their coins away to some faraway company. As long as you send your coin to a reputable firm (which are discussed below), you should be OK. Don’t go cheap, and by all means avoid the third-tier coin grading firms if you really want to ensure your coins have the best chance of getting top dollar when you decide to sell them. If you think you have, for example, a 1943 copper cent or other rare piece, there’s no way you’re going to simply walk into your local coin dealer, sell that rare coin, and stride out of there with thousands of dollars of cash in your hands. For the most part, that simply isn’t the way the coin industry works these days. Almost all seriously rare coins are traded in slabs today, and most high-value pieces, such as 1943 copper cents, are sold at auction. Counterfeit and altered coins are simply too numerous and sometimes look too real for any coin dealer to risk dropping thousands on a fake. So, if you believe you have a rare coin and are truly serious about selling it, your best bet is to spend a nominal amount of money and first get it authenticated before attempting to sell it through a coin dealer or auction house. As mentioned earlier, there are a solid dozen (or more) different certification companies out there, though only a handful have gained a longstanding reputation in the industry. These are the services that are most worth your attention when it comes to spending money on certification services or buying coins that are already encapsulated. Bear in mind that some coin grading services require memberships, and sometimes one must first submit their coins to a coin dealer or authorized professional who will then submit the coin to the grading service on your behalf. All of the third-party coin grading services listed above are generally well regarded by most coin hobbyists, dealers, and investors, though it is important to note that PCI is no longer in operation. For the most part, coins certified by the coin grading companies listed here are widely available at local coin dealers, online numismatic retailers, and on eBay. ANACS – Having started in 1972, ANACS was the first widely recognized coin grading service and is now the oldest by several years. A service provided by the iconic coin organization known as the American Numismatic Association (ANA), ANACS grades all types of coins, and does not require any special memberships or submission process to send a coin in for certification. ANACS is also one of the most competitively priced coin certification services around today. ICG – This coin grading service began in 1998 and has certified millions of coins since its inception. ICG grades coins, tokens, and medals from the United States and around the world. One of the many attributes that sets ICG apart from other graders is its quick turnaround time. Also, ICG does not require any memberships to submit coins for grading. NGC – One of the most widely heralded third-party coin graders, NGC was launched in 1987 and has become the largest coin grading firm in the world by volume. NGC is also the “official” coin grading service of both the ANA and Professional Numismatists Guild (PNG). NGC, which has several satellite locations around the world, certifies coins from the United States and other nations. To submit coins for certification by NGC, one must first join the NGC membership club. PCI – The now-defunct PCI slabbed its first coin in 1989 and for many years was considered a second-tier (and reputable) coin grading service. In its earliest years, PCI was widely regarded for its grading conservatism. In its heyday, PCI promoted its items at regional and national coin shows; during the later years, PCI began slabbing coins that were being advertised on television infomercials. PCI folded around 2009, briefly resurfaced, and closed once again. PCGS – Founded in 1985, PCGS is one of the longest-running and most revered third-party coin certification services. The service, founded by seven well-known coin dealers, including company president David Hall, slabbed its first coins in 1986 and has since gone onto to become one of the most revered coin grading companies. One must be a member of PCGS or submit coins to a PCGS-authorized coin dealer to procure certification services from the firm. SEGS –SEGS was established more than 20 years ago and certifies coins from the United States and around the world. SEGS encapsulation slabs have been tested by several chemical companies and are proven inert. In fact, SEGS claims the coins can remain in their holders undamaged for at least 100 years. The company accepts submissions straight from hobbyists, so you don’t need to be a member of a club or submit coins through an authorized coin dealer. No matter what your favorite third-party coin grading company is or what you might hear somebody say about this coin grading company or that one, use this rule when buying slabbed coins: “buy the coin, not the slab.” That is, inspect the coin within the holder, and let the grading opinion on the slab come second. Sometimes, even the best coin grading firms get it wrong, and it’s possible that the coin may have toned or even become damaged since its encapsulation, thus rendering the stated coin grade irrelevant to the current condition of the individual coin being bought. 99.9 percent of the time, slabbed coins are genuine, and most times the coins are fairly and accurately graded. But, still, one must always exercise due prudence when buying any slabbed coins, and inspect each coin as if it is raw. While ICG, SEGS, and ANACS are clearly popular coin grading services, along with older PCI coins, the two heavyweights in the third-party coin grading arena are, without any doubt, PCGS and NGC. Both got their start in the mid 1980s and quickly rose to prominence in the coin industry. Significantly helping both coin grading firms rise in popularity was the atmosphere of the coin market at the time, which was driven be Wall Street investors who were buying certified, high-end coins at record prices. Even after the coin market collapse, which began during the second half of 1989 and lasted well into the 1990s, PCGS and NGC maintained strong interest among the likes of big-time numismatists who wanted their coins accurately graded and investors who were coming back into the market during its recovery. Over time, PCGS and NGC have gained a solid reputation because they are selective in the coins they grade, tend to draw pieces from a collector base that do business with a small group of vetted coin dealers, and reject coins that are cleaned, damaged, or otherwise deemed unfit for certification. Over the years, PCGS and NGC have done their best to maintain grading accuracy and consistency during a period that has seen Mint State coin grading become more competitive and nuanced than ever. Today, there aren’t only intermediate uncirculated grades such as MS-64, MS-66, MS-68, and MS-69, but there are also so-called “plus” grades, which essentially signify coins that appear better than an ordinary example of its grade, but still fall short of qualifying for the next grade point. Those who submit coins, as well as those who buy coins, seem more intent than ever on getting MS-69 and MS-70 grades on their slab labels, especially on coins that represent early strikes for their type and/or date of issue. Still, PCGS and NGC have maintained steadfast in their grading criteria, even at a time when it seems MS-67 or MS-68 grades are no longer good enough for some people who buy modern coins. So, what are the differences then between PCGS and NGC? Both coin grading firms are frequently used by major auction houses and are patronized by the top collectors and investors in numismatics. Both coin grading companies have certified more than 30 million coins each, a claim that has helped both services become the premier coin grading companies around today. Ultimately, those who buy and sell a large number of coins will notice that PCGS coins tend to go for a slightly higher amount of money than a similarly graded NGC coin. This is not a statement of opinion, but one based on empirical fact, as a glancing scan through any of the eBay auction listings here at Coin Values will verify. Why is this? Why do PCGS coins tend to sell for more? There is some degree of opinion in the coin industry that PCGS may have slightly more conservative grading standards than other companies, which is why an 1889 MS-65 Morgan dollar in a PCGS slab might sell for more than the same coin in an NGC, ANACS, ICG, or other coin slab. Is it true, however, that PCGS is a more conservative coin grading company that others? This is, after all, a longstanding perception that is reflected pricing data, in transactions during coin shows, and certainly when the hammer drops at an auction house or online auction site. However, it is a perception that has been unproven and, at best, provides fodder for anecdotal numismatic stories. It should be remembered that both PCGS and NGC grade their coins as accurately as they can, and are always refining their methods to offer the collector and investor the best, most reliable coin grading services possible. PCGS and NGC hire some of the most well-qualified coin graders in the country. Each company hire several dozen full-time staffers, most of whom have many years in the coin industry as dealers, graders, and students of the hobby. As in any industry, there are those who simply stand by their name brand of choice. In some ways, the comparisons drawn between PCGS and NGC are no different in origin than the types of distinctions drawn between auto manufacturers Ford and Chevrolet. In the world of antique cars, there are enthusiasts who say Ford is the best carmaker, while others claim nothing beats a Chevrolet. Likewise, PCGS and NGC also have their respective fan bases, though both coin grading companies are respected, trusted, and have a virtually equal standing in the world of rare coins when it comes to authentication, grading, and overall reputation. Some of the most valuable coins ever traded at auction have been encapsulated in either PCGS or NGC holders, and it goes without saying that both coin grading firms continue to raise the bar in the third-party coin grading industry. The coin world is an ever-changing place where few coin grading firms have survived beyond a handful of years. 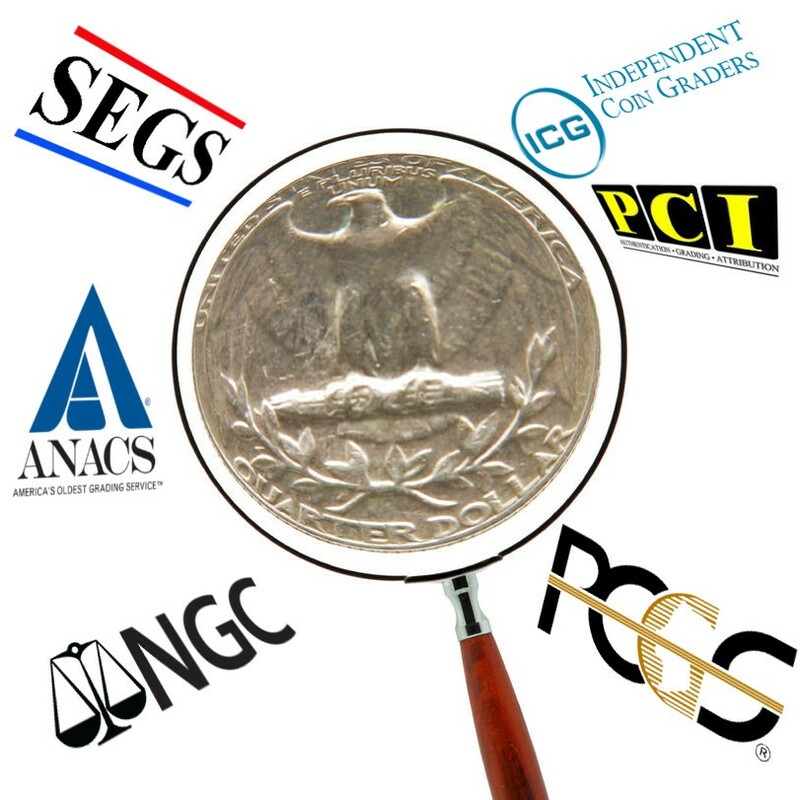 It says a lot that PCGS, NGC, ICG, ANACS, and SEGS remain on the scene while many other coin grading companies have not been able to capture a large share of the market or have simply fallen by the wayside altogether. Indeed, it’s wise to buy slabbed coins whenever you can, especially if you are buying coins from sight-unseen sources such as eBay, other online auctions, or mail-order coin dealers. While raw coins make fine purchases and often go on to achieve high grades after encapsulation, nothing beats the security and peace of mind that you will have when buying a coin encapsulated within a slab from the likes of PCGS, NGC, ANACS, ICG, or any of the other well-known third-party coin grading firms in the industry.